BMW Malaysia today announced that the F48 X1 and F26 X4 are set to be locally-assembled – production will begin sometime in mid-year, and when it does the duo will become the ninth and tenth models to join the portfolio of BMW vehicles assembled in the country. The mention of the upcoming CKD programme for the two was made earlier today at the announcement of the customised EEV status incentives for the BMW 3 Series Gran Turismo, X3 and 5 Series. No pricing was intimated for the X1 and X4, but we should be expecting to see a lowering of retail prices in the same vein as that for the above. 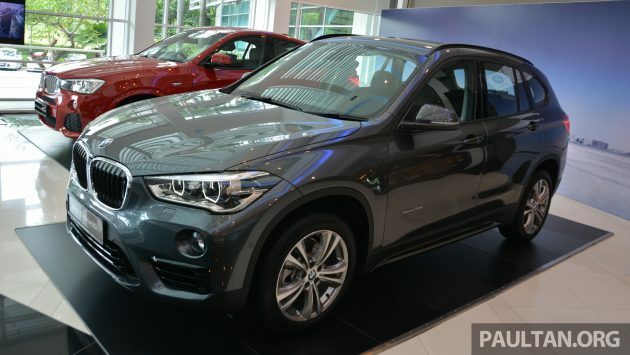 The second-generation X1 was first introduced in Malaysia back in October last year, the SUV arriving in a single variant form, the sDrive 20i, which was priced at RM279,800 on-the-road without insurance. The same variant will continue on for local assembly, though a diesel version is also set to be introduced. For the petrol, we’re told that the equipment and specification for the CKD version will mirror that seen on the CBU car. We’ve covered the salient points of the X1 in our review from the international drive and, more pertinently, from the local launch last year, but a quick recap on general specifications. The sDrive20i is powered by a twin-scroll turbo 2.0 litre four-cylinder engine with 192 hp and 280 Nm of torque, and the mill is paired with an eight-speed Steptronic automatic gearbox. Performance figures include a 0-100 km/h time of 7.7 seconds and a 225 km/h top speed. The new locally-assembled BMW X1 will be available in four exterior colours for the sDrive20i, these being Alpine White, Black Sapphire, Mineral Grey and Sparkling Storm. Like the CBU model, the locally-assembled petrol X1 will be kitted out in a Sport Line trim, which comes with gloss black/body colour exterior. No mention of what the line the diesel will come in, but five colours are mentioned – Black Sapphire, Alpine White, Mineral Grey, Glacier Silver and Mediterranean Blue. 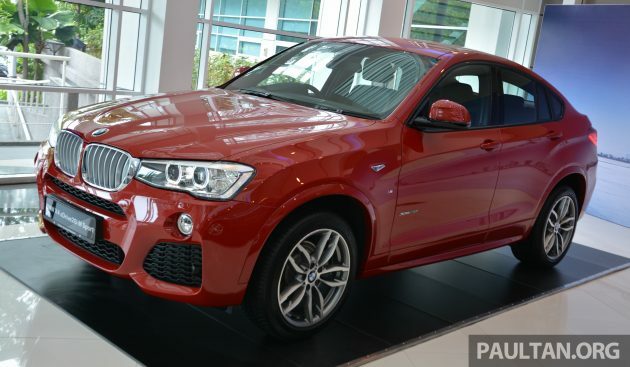 As for the X4, which made its local debut in August 2014, local assembly will see the xDrive28i (RM435,800) and xDrive28i M Sport (RM465,800) models continuing on. The SAV is powered by a 2.0 litre turbo engine with 245 hp and 350 Nm of torque from just 1,250 rpm. The direct-injected twin-scroll turbo motor is paired to BMW’s eight-speed automatic transmission, and power goes to all four corners via BMW’s xDrive system. Performance specs include a 0-100 km/h time of 6.4 seconds and a 232 km/h top speed. Colours that will be available for the new locally-assembled BMW X4 are Alpine White, Sophisto Grey, Carbon Black, Glacier Silver and Melbourne Red, while interior upholstery options consist of Leather Nevada Mocha and Leather Nevada Black. We’ll have more on the locally-assembled BMW X1 and X4 when they’re officially introduced in the country. CKD also the price can be Rm280k ah? The ministers think RM280k is so cheap and affordable to most Malaysians. this car is so cheap globally. Even McDonalds worker can buy this car with 2 years of savings. Come to Malaysia, even with CKD, the price can be RM280k. Where is Najib’s promise to reduce car prices by 30%? In US, more powerful X1 28i engine and CBU but price about US$30k. (Rm100k). Here we CKD also price can jump to RM280k. In SG, price will be 280k SGD! And thats w/o COE! U need to add 3X more! Then lifespan for this car only 10 years before need to scrap! Somemore need to add GST, ERP, and ‘donation’ to PAP! Owning one alredi cekik myself, then to drive it need to double cekik myself, then later to replace it need to triple cekik myself! MY can syukur own it for 30 years no problemo! Any sight on CKD 4 Series Gran Coupe? Really hope BMW Malaysia consider this model. Btw X4 have any plan in the list X4 35i or not??? but really 1% chances only this model CKD since road tax is killing!!!! SA mention the CKD price for the petrol X1 will be around 250k which is a huge decrease from its current price tag. I wonder if the rest of the X lineup will have EEV status like the X3 since technically they share the same engines. HRV or CX3 for less than half the price got keyless entry and reverse camera. In overseas markets the X1 is fitted with standard power tailgate. Why all these ‘luxury’ features not standard in BMW here? Why I never saw a Bmw x4 in malaysia? What is the problem with this car?